Come celebrate our beautiful Wild Rivers Recreation Area of the Rio Grande del Norte National Monument, and the historic sites in and around the village of Questa, NM. Participate or watch and experience plain air painting at our 3rd annual Paint-Out. This year’s special theme is Wild and Scenic Rivers and Trails, in recognition of the 50th anniversary of the Wild and Scenic Rivers Act and National Trails System Act, both signed in 1968. The Paint-Out is open to persons of all artistic levels, age, and arts media. On July 21-22, come to the pop-up art show to see the results! This year’s show will be held at the historic Brass Rail Theater in the Alpine Lodge on the main street in Red River, just 12 minutes’ drive east of Questa. 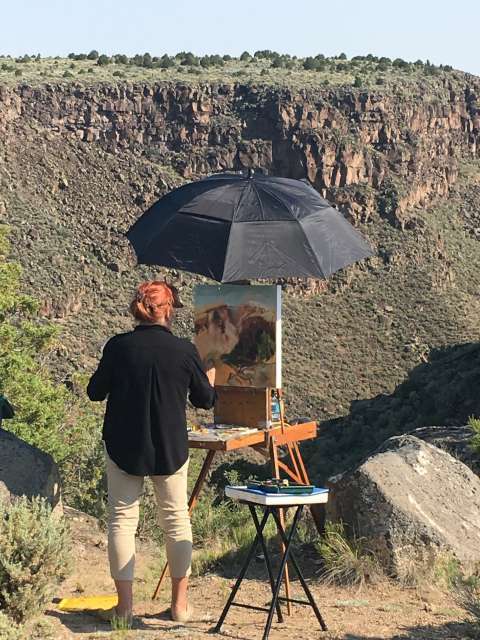 Artwork created by over 50 plein-air artists will be on display during the exhibit; open for just two days. The Awards Ceremony will take place at the Opening Reception on Saturday evening, including People’s Choice awards, come add your vote!